I'm a big fan of James Martin, especially his cake recipes, and have made his Lemon Meringue recipe a few times now, always with good success. This time, I wanted to utilise my new tartlet tins, and try and doing some mini ones, and try and hone my meringue piping skills a bit at the same time. The couple of times I've tried piping meringue in the past it has been a complete failure, and I've ended up trying to rescue it with a palette knife afterwards. This time, everything went a little more according to plan, and the finished meringues looked half decent and definitely went down well with those who tasted them. To get the recipe, head over to James Martin's at the BBC website. Instead of the pastry recipe given here, I used some Pâte Sucrée pastry cases that I had already made for my Strawberry and Chocolate Tartlets. I also halved the amount of Lemon Curd filling, and Meringue. 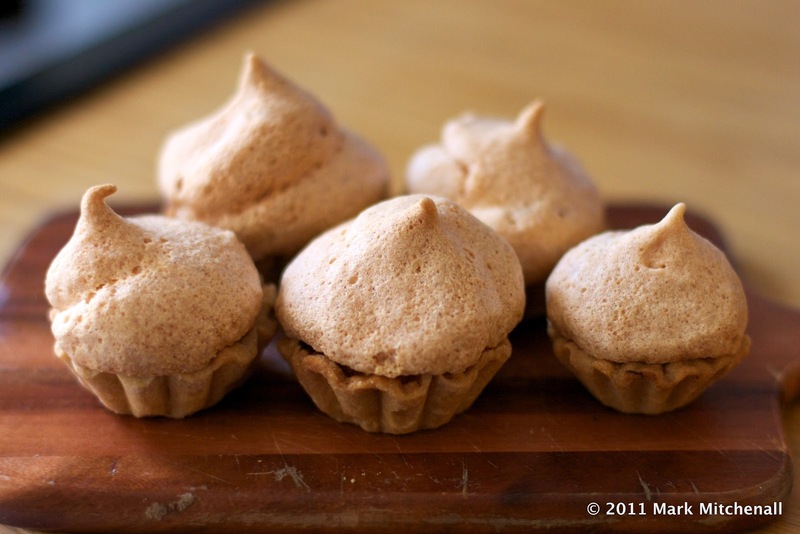 In all, this made about 24 mini Meringues, on 5-6cm tartlet cases. Bake for about an hour in a 160°C oven.